The semi-final of a cup competition should always be something to savour, especially when it is your club that holds the advantage even if it is by a single goal. However, there is an air of trepidation for the second leg at Stamford Bridge as injuries has ravaged the Lilywhites leaving them looking a little exposed. Yeah sure, rumours are abound that replacements will be brought in but after a summer in which the club invested the grand total of zero and the fact that this game is played in a matter of days not weeks, one suspects Mauricio Pochettino will have to make do with what he already has. First leg goalscorer Harry Kane is out until March and Dele Alli suffered a hamstring injury in the narrow victory over Fulham at the weekend and looks set to miss out. With Son Heung Min on international duty and Fernando Llorente hellbent on scoring at the wrong end of the pitch, it leaves Tottenham looking pretty light up top. Cue 90 minutes of eleven behind the ball in the hope that the same Chelsea side that turned up to face Arsenal at the weekend runs out on Thursday to give us a chance. Of course, the ball is in Tottenham’s court as a draw will be enough to send the Lilywhites back to Wembley for the 16th time this season. The game could not be happening at a worse time for both clubs, Tottenham’s injury woes are well documented but the for the Blues it seems there is another problem. Head coach Maurizio Sarri appears to be playing a dangerous game claiming his side are difficult to motivate following the loss to Arsenal on Saturday. Sarri has looked a little lost at times this season but on the other hand the comments could act as a way to spur and undeniably talented side on. The last three meetings between the two has gone in Tottenham’s favour but a League Cup semi-final is a very different affair from a bread and butter Premier League encounter. 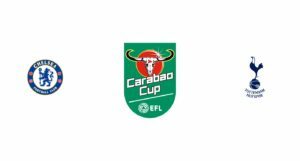 The Blues famously beat Tottenham in the 2015 EFL Cup final and will fancy their chances of overturning the single goal deficit against a side who pose a significantly reduced attacking threat. However, Tottenham did manage to keep a clean sheet away at Arsenal in the last round of the competition and managed to nab the win at Fulham on Sunday despite the depleted squad. I doubt Spurs will win inside 90 minutes, but I doubt they will lose especially with Sarri’s current issues with his squad. A 0-0 draw on the night is a result that will keep the North Londoners happy but heap more pressure on Maurizio Sarri as Wembley beckons once again for Tottenham, even if they will probably get steamrollered by Manchester City.